Properties in Le Mesnil average 4.7 out of 5 stars. Comfortable accommodation combines quiet sea view. Property 6: Comfortable accommodation combines quiet sea view. 100 meters from the beach, charming villa. Property 7: 100 meters from the beach, charming villa. 50 meters from the beach, very quiet and cozy home, ALL INCLUSIVE PRICE. Property 18: 50 meters from the beach, very quiet and cozy home, ALL INCLUSIVE PRICE. 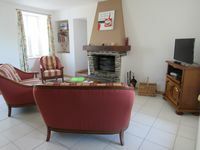 Large Beautiful Gîte, Just a few meters from the Beach. Property 30: Large Beautiful Gîte, Just a few meters from the Beach. Quiet and spacious house 50m from the seaside. Property 37: Quiet and spacious house 50m from the seaside. Winter holidays and Passover to the sea! Great beach house. Accepted animals. Property 42: Winter holidays and Passover to the sea! Great beach house. Accepted animals. Lovely house, neighborhood and hosts! We had a wonderful time in Saint-Remy-des-Landes. The house is new, well equipped and was very clean! With a big lawn filled with floders. Close to beaches, stores and some beautiful towns like Portbail. Hosts was very helpful and responded quickly on all our questions. Highly recommend it!